Carpet is a very important furnishing. Not only does it spruce up your living space, it also brings warmth and comfort to your home. But because they are constantly used, carpets are always almost prone to damage, particularly water damage. More than the occasional coffee spills, carpets can get damaged due to roof leaks, broken or clogged gutters, plumbing problems, and even poor insulation around your house. If water damage came from a clean water source and was identified within 48 hours, cleaning the carpet by yourself is a great option. But if the water damage came from contaminated sources, such as flooding, it is recommended to contact professional cleaners for help. Water damage especially in carpets can cause serious problems to your property and your health. First and foremost, it can lead to mold build-up. Mold can take over your carpet quickly, usually within 24 to 48 hours after exposure to water or moisture. If you smell a “musty” odor in your carpets, chances are, microbiological volatile organic compounds (MVOCs) have grown in there, and they include mold and mildew. The most common mold that thrives inside homes are called saprophytic mold, which normally lives in decaying dead organic material. When there’s mold growth, then there’s health hazards. Exposure to mold is known to trigger respiratory problems. Common symptoms of mold exposure include shortness of breath, severe asthma attack, nasal decongestion, and chest congestion. In addition to respiratory issues, exposure to mold can also cause skin allergy and irritation. At first, symptoms start with having itchy, red skin. As the allergy progresses, more severe symptoms can occur, such as bumps and swellings. And because mold is a microbe, it can cause bacterial and fungal infections too. The influence of mold is different depending on people’s age, e.g. if allow indoor mold to proliferate, the elderly people will easily get cough, fever, chills, fatigue etc., as according to the CDC reports, a condition called hypersensitivity pneumonitis, is a possible complication of mold exposure. There are many other common “rules” to keep elderly people healthy while being home. 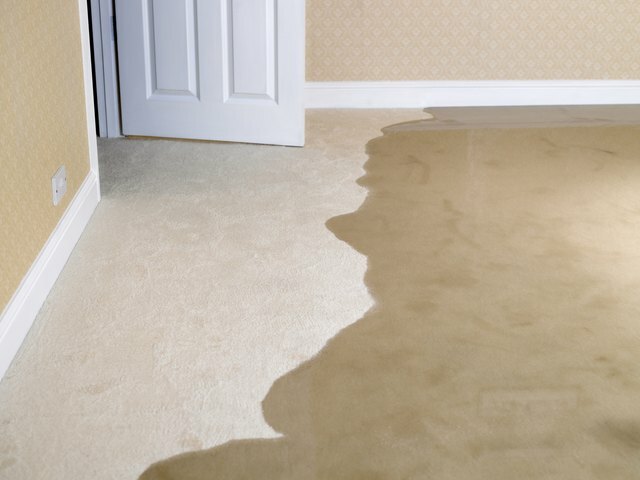 When it comes to resolving carpet water damage, the key is to act fast. Once you notice signs of water damage, such as a musty odor, wetness or moisture on the carpet, you have to deal with the problem immediately. 1) Remove and clean the carpet immediately. As a general guideline, carpets that have been contaminated by “gray” or “black” water should be removed and disposed. Carpet padding can be restored if exposed to water less than 48 hours or less, or when just a small part has absorbed moisture. If it has been affected by flood, it should be replaced. If the wet area is very small, there’s no need to remove the carpet. It can be cleaned using warm soapy water, and then a water vacuum. Patting the wet area with dry blankets and towels can help absorb excess moisture too. 2) Use chemical cleansers to remove mold from carpets. If there’s a presence of mold in the carpet, a specialized cleaning solution like high-level disinfectant is needed to disinfect and sanitize the surface. Take note, however, that these chemicals are potentially dangerous so proper handling is very important. Wear appropriate gears, such as hand gloves and mask to protect yourself against exposure to mold and chemicals. If you are not comfortable dealing with carpet water damage on your own, it is advisable to call the pros. Water damage remediation experts have the skills, training, and equipment to do the job effectively. They can also ensure that your carpet (and other water-damaged areas in your home) are completely cleaned, sanitized, and dried. 4) Get the air flowing freely. An air mover and a dehumidifier are useful tools for removing moisture indoors, which in turn, helps speed up the drying time for carpets. Continue to run an air mover or dehumidifier during and after cleaning carpets for fast results. Carpets exposed to floodwater would normally take 3 days to 5 days to dry completely. It is best to dry them outdoors, under the sun. 5) Check furniture, wall or floor near the water-damaged carpet. You should also check the surfaces near your carpet as they could have been exposed to water/moisture or mold too, particularly the walls and floors. For furniture, look for signs of peeling, cracking, warping, or staining as they are indication of water damage. Lastly, make sure to address sources of moisture and water problems in your home. As the old saying goes, prevention is better than cure. By repairing water leaks as soon as you figure them out, you can prevent water from invading your property and avoid costly and stressful restorations in the future.